Paul Collins, author, publisher and fantastic promoter of Australian authors, has just had a new novel published called Mole Hunt. You might remember I reviewed Paul's children's picture book, The Glasshouse, recently. Below, Paul answers some questions I asked him about Mole Hunt. BC: Paul, your latest book, Mole Hunt, has just been published. Can you tell us a little about it? Paul: The author information sheet says: "In a galaxy of cutthroat companies, shadowy clans and a million agendas, spy agency RIM barely wields enough control to keep order. Maximus Black is RIM’s star cadet. But he has a problem. One of RIM’s best agents, Anneke Longshadow, knows there’s a mole in the organisation. And Maximus has a lot to hide..."
It's basically a dystopian novel set in space. Bookseller + Publisher sums it up well: "Bitingly clever" (I'm glad I didn't write that!) and "a cross between The Girl with the Dragon Tattoo, Dexter and Total Recall". Buzz Words said it's so fast paced that it'd "...give Matthew Reilly a nosebleed." BC: Who do you see as the audience for Mole Hunt? 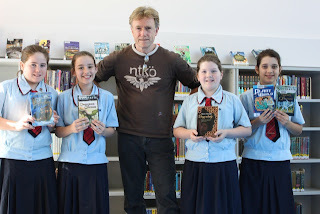 Paul: I wrote it specifically for boys who like fast-paced action -- I guess the Matthew Reilly audience. But it seems a lot of adults are getting into it as well -- not surprising these days when YA fiction is being equally read by adults as it is by the initial target audience. BC: I know lots of people like to read about dystopian worlds. What do you see as the attraction for young readers to dystopian worlds? Paul: I think young readers get to test out their own belief systems and moralities without getting too close to the real issues – because they get to empathise with the characters in the books instead. It’s commonly set in bleak or post-apocalyptic landscapes where resources are scarce, and features futuristic technology, mind control, violence and war. Books like The Hunger Games and The Maze Runner really brought dystopian fiction back into vogue. Of course, this genre has been around for a long time. BC: As a writer, why did you choose such a world for your setting? Paul: I’ve written it in the past with The Earthborn Wars published by Tor in the US (The Earthborn, The Skyborn and The Hiveborn). Fifteen years before The Hunger Games, I also wrote a virtual reality dystopian novel with a remarkably similar plot called Cyberskin. People dying from a terminal illness can sign their lives over to a legal “snuff” movie company and get killed live for the audience (for payment, of course – a life insurance policy that goes to their grieving family). They’re pitted against a superior fighter who is an enhanced fighting machine. So it’s a genre within which I feel comfortable. 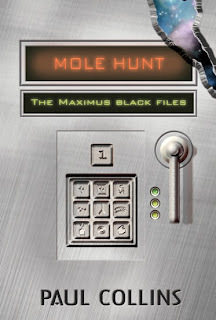 BC: Where can we find out more about Mole Hunt in particular, and all of your other books, too?